The hunman body sensor has a built-in integrated light intensity sensor, detects brightness of light. With 7 m detection distance and 170 degrees detection angle, it is practical and powerful. Also, it is rotatable in pan and tilt derection with a flexible holder stand. With built-in integrated light intensity sensor, it can detect brightness of light. 7 m detection distance, 170 degrees detection angle, very practical. Notice function, sent alert to you through the APP, extremely convenient. Rotatable in pan and tilt derection with a flexible holder stand. 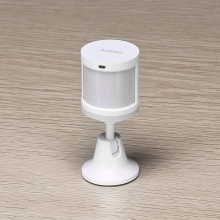 Can be connected to multiple human motion sensors with simple operation. Easy to install in multiple methods with the stickers, can be easily installed anywhere.